The well-being of your dogs depends upon those taking care of them. 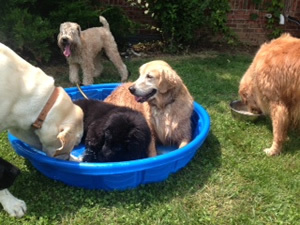 At WagsInn, we take individual attention and socialization to heart. We have created a safe place for your dogs to get the exercise and loving attention you intended them to have. 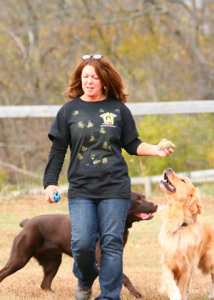 Our interactive environment helps provide the stimulation your dogs need to be happy and well-balanced. They will enjoy one-on-one attention with staff as well as walking with the pack, chasing balls through the fields, and socializing with other canine buddies. Personalized attention and cozy accommodations make WagsInn “Your Dog’s Home Away From Home.” Reserve now for your next trip. Whether you need lodging for a night or for an extended time, your dog will love staying at WagsInn. You may choose which accommodations best fit your dog. We have the Houndstooth Lounge where they can relax on the couch or curl up in the chair. Or, they just may decide to snuggle on the Kuranda dog beds in their own personal suite. Perhaps, just like at home, you’ll choose to have them rest comfortably in their crate in our air-conditioned and heated rooms. For those Great Danes and extra-large dogs, we have the colossal crates for their comfort. Bedrooms in our main house are also available for special needs. Make your reservation today! Separation anxiety, aggression, and destructive behaviors can be the result of not getting the proper exercise and discipline they require to satisfy their needs. WagsInn is filled with stimulating activities to relieve such built-up energy. Call us at 937-265-5178 to schedule an appointment. Note: You will be notified by text or email when daycare is cancelled due to holidays, weather, or staffing. After lodging at the Inn, we can bathe your dog in a relaxed and calm setting. Cost is $25-$30 per dog (comb out, shampoo & conditioner treatment). Nail trimming is an additional $10. Our WagsInn Wagon provides transportation to and from WagsInn Monday through Friday. $35 to $45 average cost for transportation.